Recently there's been a few drug companies that seem to have found a loophole in the drug advertising system. The law from the Food and Drug Administration is, if you are advertising a product, you have to name all of its possible side effects and dangers, which can often consume many costly seconds. However, if the product is not named, then side effects can be omitted from the ad. The ads you saw obviously direct you to the website Silence Your Rooster. Here the product is advertised, and all of the information about the drug at hand (Ambien CR) can be found, without the advertiser having to buy air time. It's a neat tactic, and I wouldn't be surprised if this became the next big thing in drug advertising. All they have to do is set up some brand association in an initial set of ads, then drop the drug name and rake in the broadcast time. Another company working this angle is Pfizer, who advertised their anti-smoking drug Chantix with an ad directing people to Mytimetoquit.com. I really enjoyed these two, especially Knockout. The thing I like about advertising simple products, such as jeans, is that the target market already knows about the product. I'm aware of Levi's. I know how much they cost. Now I just need some incentive to go out and buy a pair of dungarees. Perhaps a little minisode that tickles my cranium? Yes, yes... that'll do. I've been seeing a few automobile adverts that, while not warranting their own post, are worth a nod. Enjoy. Last night, TBS aired a special called "World's Funniest Commercials 2008" hosted by Keven Nealon and his wife Susan Yeagley. Now, I am the TV ad guru, so I had to check it out... especially since one of my favorite Weeds stars was hosting. Alas, I was sorely disappointed with the presentation. The hosts failed to keep my attention with their half-witted quips and dull introductions. Then, when I visited the website (link provided above), I was appalled to see TBS trying to associate bananas with their collection of self-proclaimed "very funny" ads. Bananas are not funny. Andy Warhol would not be proud. Some of the commercials featured were quite clever and entertaining. What I had a problem with was the show's poor attempt to award medals to the top three commercials. The Olympics are OVER. Please move on. Bronze and Silver weren't that bad. But the Gold medalist? The ad had no taste and was extremely childish. In my opinion there were superior contenders. I guess there's always next year. In the end: some good spots, but what a terrible presentation. TBS... how about you just run Seinfeld 24/7 from now on? The world would be a better place. LEGO celebrates the 30th birthday of the Miniman! This commercial highlights some of the most monumental events in the past few decades -- in LEGO Miniman mode! 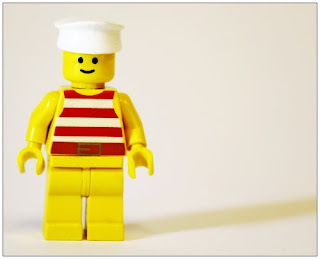 Don't forget to check out their website and a couple of vintage LEGO commercials. I'm a total LEGO nerd, so this really brings me back to the good old days. Go, go, Miniman, go! After a slew of negative attacks against him from McCain's minions, Obama and his team have released this new campaign video. Maybe the association with the Bush administration will sway voters back to blue. I still don't agree with mudslinging such as this. Why can't we all just get along and do some healthy, polite self promotion? I guess the answer there is in the polls: A few months ago it seemed almost definite that Obama would clinch the presidency, but now the numbers show that McCain actually has the advantage. Many believe that the slump in Obama supporters is due to McCain's attacks. Another factor that may effect the popular vote is Barack Obama's new running mate: Joe Biden. Getting back to the commercial, I really don't even like it. Looks like a college intern threw it together in PowerPoint with some help from Google Image Search. Honestly, how about some creativity people? This spot for the new video game, Tiger Woods 09, is called "Walk on Water" and there's a cameo: YouTube.com. Apparently in the last release of the Tiger Woods game, there was a glitch (or an option?) that allowed the player to prance on the ponds in order to hit a ball out of a water hazard. Generic gamer Levinator25 decided to showcase this feature on the most popular video hosting site in the world. Somebody must have noticed and saw a perfect opportunity for quite the clever response -- in the form of a national television commercial. The agency responsible for the ad is Wieden + Kennedy, Portland. This spot just goes to show how popular YouTube videos have really become, and also how the world of the web can be interconnected with almost anything. This commercial is a medley of media: a TV commercial featuring an internet video advertising a video game. It really is beautifully executed and well created. Notice the sloppy camera work and simple screen text? That's not a sign of a small budget my friends... it's a play-on-looks. Brilliant work. A recent study called "The Commercial Games" conducted by Commercial Alert and Multinational Monitor (two companies that keep tabs on big corporations) has argued that the International Olympic Committee should drop sponsors whose products include fast food, soda, and alcohol. The groups think that these products do not jive with the Olympics' overall message of celebrating healthy living. Obviously the main companies under attack are Coca Cola, McDonald's, and Anheuser Busch. Although these companies wouldn't go out of business without Olympic sponsorships, these global brands would be at a significant disadvantage in terms of missing an opportunity to reach a global audience. Are these types of endorsements really harmfully associated with the Olympic games? Sure, plenty of kids tune in and are exposed to these ads, but the companies in question are so voluminous that children will see their advertising anyway. Even if gold medalists aren't scarfing down Big Mac's and washing them down with Coke, the majority of people who watch the games are. Yes, the Olympics display the best in physical fitness and health, but the sponsorships being targeted by this study are more than what they produce for consumers. These companies are global brands that help to improve the quality of life and they all have foundations and programs established to better society using their wide ranges of awareness. Ecomagination spots have been all over Olympic coverage. It's GE's way of visually expressing what they're doing to improve the energy crisis. Their tag line "Imagination at Work" is an ideal phrase to describe the majestic commercials which they have produced. You've probably seen at least two or three of these, but keep watching and I bet you'll find a favorite. I like how GE is taking a mundane premise, such as wind or natural gas, and turning it into a unique display of nature and innovation in technology. Just some mediocre ads that are not worth their own posts, but might deserve your eyes. The first two aren't that bad, the last group... Well, I was hungry. There's something not quite right with this commercial. I know the correlation isn't 100% direct, but I for one do not appreciate ice cream in a commercial for toilet paper. You see, Charmin has done a good job of branding their characters. 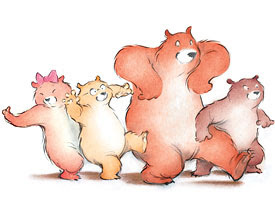 When I'm watching TV and these bears pop up, I instantly think: toilet paper! The problem I have with this ad is the abundance of round blobs falling to the ground, splattering messily onto the grass below. I know what they're trying to say: kids take more toilet paper than they need, just like how they take more ice cream than they need. It's a good analogy, but maybe toilet paper should not be remotely related to any type of food, especially round blobby ones. When I see that blue Charmin bear covered in spots, I think "Hey, he'll probably use some of that Ultra Soft Charmin toilet paper to clean himself off." Then my brain makes some fairly normal associations... "Well, if he uses toilet paper, then what exactly is that multicolored mess?" Do you see where I'm going with this? 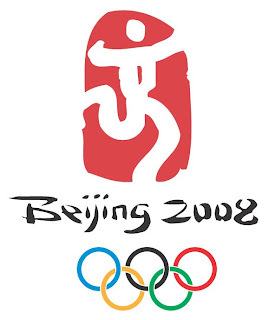 This ad played during the opening of the Olympic games in Beijing. The song is called "A Minha Menina" by Os Mutantes. If you've ever asked anyone under the age of ten what they would like for dinner, then you should appreciate the truthiness of this commercial. At the time of this post, the medal count lists the US in third place, behind China and South Korea. But this ad by McDonald's says that winning isn't everything especially when there's cheap fast food readily available after devastating moments of defeat. Hooray for obesity! Well, I've been watching the Olympic games every chance I can get to a TV, and this is the first commercial I've seen that I actually like. It might have something to do with "All These Things That I've Done" by the Killers (one of my favorite bands). Nike showcases all kinds of athletes, Olympic and beyond, in this emotional spot. Their message is simple... their ad is complex. Split second flashes of everything from animals to comic book stars combined with countless sports icons make you want to go back and watch it again for stuff you missed. It's interesting to get a frame-by-frame by pausing and dragging the marker slowly across the timeline. Check marks galore, huh? Subliminal advertising strikes back! Here are the athletes featured in the ad: LeBron James, Bill Bowerman, Vasily Alekseyev, John McEnroe, Cristiano Ronaldo, Pau Gasol, Ralph Boston, Ladji Doucoure, Wayne Rooney, Maria Sharapova, Henry Marsh, David Lega, Mary Lou Retton, Zhu Jianhua, Liu Xiang, Carlos Lopes, Daiane dos Santos, Steve Prefontaine, Paula Radcliffe, Joan Benoit-Samuelson, Wallace Spearmon Jr, Julie Moss, Omar Salazar, Miho Shinoda, Lance Armstrong, Kenny Bartram, Garrett Reynolds, Hasely Crawford, Carl Lewis, Kobe Bryant, Bernard Lagat, Mary Decker Slaney, Kerry O'Brien, Pete Sampras, Manfred Naumann, Derek Redmond, Arthur Ashe, Roger Federer, Elizabeth Jackson, Sherone Simpson, Jon Lester, Michael Johnson, Michael Jordan, Romualdo Kubiak, and Oscar Pistorius. For more, including details on each of these athletes' feats of courage, check out Nike's site. It's getting closer and closer to Labor Day and soon all of the kids will be back in their cells. I mean classrooms. The question is: which side of the mall will they get their back to school clothes from? Department store giants J.C. Penney and Sears have released their fall fashion commercials, and both of them are something special. It's a Breakfast Club themed commercial with a cover of "Don't You Forget About Me"! Cute, but will the younger audiences recognize the reference? And this, a full length music production featuring real life Disney princess Vanessa Hudgens. Nice, but couldn't they have splurged for the Jonas Brothers? This segment features specialty marketing that may go beyond the usual limits of this blog. Black Eyed Peas sensation Will.i.am has just released the video for his third single off his most recent album. The song is called "One More Chance", and there's something very special about the visual creation that some are calling a music videomercial. While Will.i.am sings at the bus stop, he does so in the company of an exceptionally obvious BlackBerry poster. Then he uses his logistic-and-perception-bending powers to grab the phone out of it's two dimensional frame and flip it around in the palm of his hand like he's cooler than a jeweler -- a fairly obvious product placement ploy that's giving this Jamaican American a bad reputation. Bloggers and news sites alike are claiming that Will.i.am is selling out by plastering the cell phone brand across his music video. People are turned off by the blatant corporate presence blaring in their faces when they least expect it... but is the BlackBerry cameo really that terrible? First, you have to look at the video as a whole. It's a music video before a commercial; not the other way around. There is an enjoyable mini storyline... one that I find more interesting than a good chunk of current music videos' plots. Also, after a few listens the song has actually grown on me. Next, the connections between Will.i.am and the presented brand should be analyzed. Will.i.am's politically charged website dipdive.com has attracted a lot of attention for its pro-bama 'Yes We Can' and 'We Are The Ones' videos. BlackBerry developer Research in Motion just recently announced their partnership with dipdive, allowing the site's social networking and music content to be available on BlackBerry devices. The decision was established in hopes of making BlackBerry more of a consumer platform, much like the iPhone. Will.i.am must have been thrilled about the deal -- now his fans can access dipdive at any time or place. So, it's kind of like Will.i.am put one of his friends in the video. His buddy just happens to be a sleek wireless handheld device. It would be a different story if an artist endorsed a product in their video just for the paycheck, but in this case there is a personal connection between the two. I love it when innovation strikes like this. Advertising in the modern age has become a difficult task, and it takes new and unique ideas in order to breakthrough and be noticed. I think the reason why Will.i.am is causing so much trouble is because he's the first to advertise in this way within a music video. I'm greeting the ad with respect and admiration rather than with distaste and contempt. Give it a chance. In this new segment, I will present ads that have been banned from US television networks. Here's one by Verizon Wireless that has been stripped from the spectrum. Now to me this ad seemed harmless. When I first saw it I actually didn't really like it anyway. Why would you dare someone to touch something that's just out of reach of a vicious dog? If the dog wasn't on a leash, then it may have been a little more effective... And possibly more accepted by PETA. Animal-rights activists complained that shackling up the hounds was a cruel and outdated practice that no longer should exist. They said that in the ad the pit-bulls were stereotyped as a violent breed of junkyard beasts, and that man's best friend deserves better than a backyard prison. In their defense, Verizon stated that the ad was "designed to be over-the-top, to break through the clutter and get [their] message across." Activists Rosa Barks, Frederick Doglass, and Mahatmut Gandhi were the key players in getting the commercial removed. Canines across the globe rejoice. 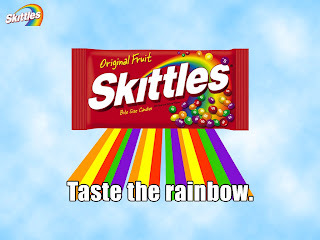 I swear, Skittles ads and related marketing content are created by people on acid (just check out their website, and don't forget to "Blend the Rainbow" on the bottom left). But just because the creatives were higher than gas prices when they thought of their commercials doesn't mean they're not good. Heck, LSD helped Francis Crick discover DNA, and once even led professional baseball player Dock Ellis to a no-hitter. Skittles has had some zany spots in the past. Who could forget the one where everything the guy touches turns to Skittles? Or the one with the man getting milked? Oh and the classic with the sheep boys, and the human piñata, and the beard one! How do they come up with this stuff? And why do I find it funny?